When you play thrash and when you chose the moniker borne by at least 20 other bands, Desecrator, you better work hard at your craft to distinguish yourself. Australians Desecrator from Melbourne are doing exactly that, working hard, touring alongside many a famous band who come to visit the land down under. That extensive touring already resulted in a live release, something that usually bands don’t start with. A Down to Hell EP being their other output piece, what we have on display today is their single Red Steel Nation. I would guess that when a single is released by a young band, as opposed to seasoned veterans, the goal is in one track to provide a signature sound to hook people into exploration of what else is there about the artist. 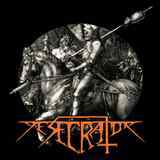 If Red Steel Nation is the “face” of Desecrator today, then I can’t say I have been convinced to be seeking their next release. Lively kneecap snapping thrash opens up the song, with jerky chords and winding skilled dual guitar leads, with the vocals which are a little too screamy and a little high. The band though has a surprisingly clean, almost too slick, too polished sound. So, rather than stay raw Desecrator prefers to be more modern, and finally settles into the half-song lasting groove. I suppose if your preference in thrash is not bestial rawness, but instead what Testament has been doing of late, perhaps you will find Red Steel Nation, a song that might last 2 min too long, right up your alley.